Need A Light Industrial Electrician? Need an Electrician in Market Weighton or the surrounding area? Atkinsons Electrical Contracting Services Ltd have been established since 2008 building a local customer base that has been built on reputation and satisfied customers. After successfully having many long term clients, including many reputable companies and building a good reputation in the area we believe we offer the best service around. In order to win your business we can offer a competitive quotation in any of the following areas and are confident you will come back to us for future repairs and projects. 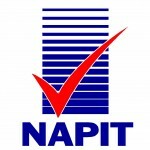 All NAPIT qualified electricians have the most current technical back up and their customers are entitled to a full complaints procedure, not that you are likely to need it! Whatever your home electrical project we are here to help. From re-wires to new builds we can work with other trades to deliver your project on time. Our experience within the electrical sector covers retail outlets, shops, offices, caravan parks, garages, hotels and resturants . As well as new projects we also cover many businesses maintenance in the area with a prompt call out response when needed . Prompt, reliable, efficient service. No problems whatsoever. Billed as quoted. Thanks, will use again, recommended. Called more or less straight away, carried out the job a couple of days later and price was very reasonable. We now have an electrician we would use over again without hesitation.